As music fans arrive in town, Petty’s former Mudcrutch bandmate Tom Leadon reflects on his teenage years growing up with the future Rock & Roll Hall of Famer. 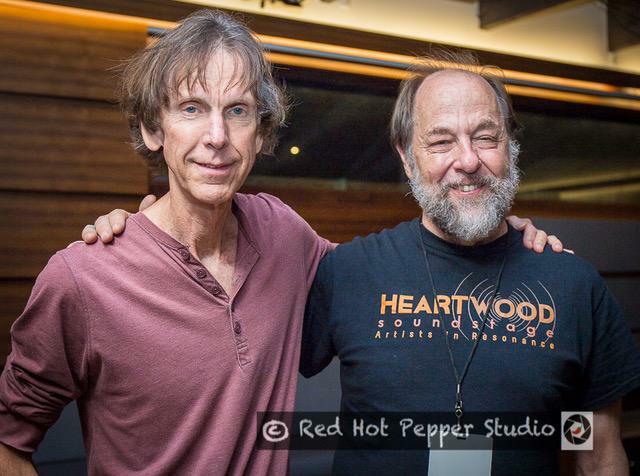 Tom Leadon seemed to be right at home on Thursday night as he mingled and had photos taken with fans during a meet-and-greet to kick off Tom Petty Weekend at Heartwood Soundstage. Then again, Gainesville is his hometown. 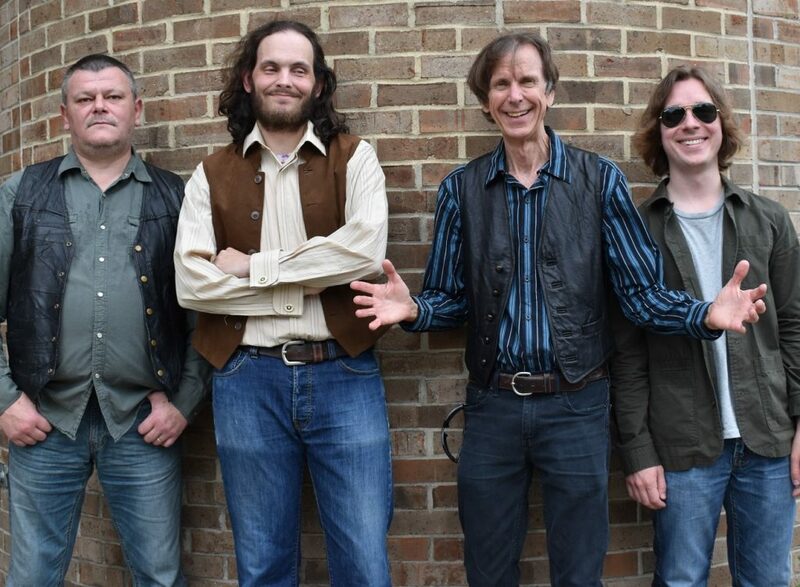 Tonight at 9, Leadon will perform in Gainesville for the first time in almost 30 years when his Nashville-based band, The Bayjacks, take to Heartwood’s outdoor stage on the first night of the two-day music festival. The homecoming is bittersweet for Leadon, a founding member of Mudcrutch, a band Petty fronted in Gainesville in the early ’70s before striking gold (and platinum) with the Heartbreakers. The Tom Petty Weekend at Heartwood and the simultaneous Tom Petty Birthday Bash at nearby Depot Park were organized as a means to celebrate what would have been Petty’s 68th birthday on Saturday. However, Leadon and others remain in shock more than a year after Petty’s unexpected death in Southern California. The Bayjacks will honor Petty by playing five Mudcrutch songs and a Tom Petty and the Heartbreakers song in addition to some original tunes. The Bayjacks will play another set on Saturday night at 8. Like Petty, Leadon grew up in northeast Gainesville off 16th Avenue, on the west side of Northeast Park. Petty grew up in a small block home on 6th Terrace, a couple of blocks across Northeast Park or “about 350 yards from us,” Leadon estimated. Although they grew up in the same neighborhood, Leadon was 14 and Petty 16 when they finally met in 1967 through a passion for music. Leadon, a guitarist, was already friends with members of Petty’s early band the Epics, but not with Petty. “They told me they were now playing with Tom Petty and they would be rehearsing at his house, in the shed in his backyard,” Leadon recalled. Leadon and Petty only exchanged hellos that first meeting, but that was enough. Within six weeks, Leadon was lead guitarist for the Epics. Mudcrutch formed in 1970 and played Gainesville haunts for five years until Petty headed west with his new band, the Heartbreakers. Petty famously reunited Mudcrutch in 2007 with Leadon, Benmont Tench, Mike Campbell and Randall Marsh. They recorded two albums and went on a couple national tours when Petty’s demanding schedule with the Heartbreakers allowed it. Petty’s death last October ended both bands. Leadon said he is delighted the City of Gainesville is dedicating Northeast Park as Tom Petty Park during a ceremony on Saturday — Petty’s birthday — at 1:30 p.m. 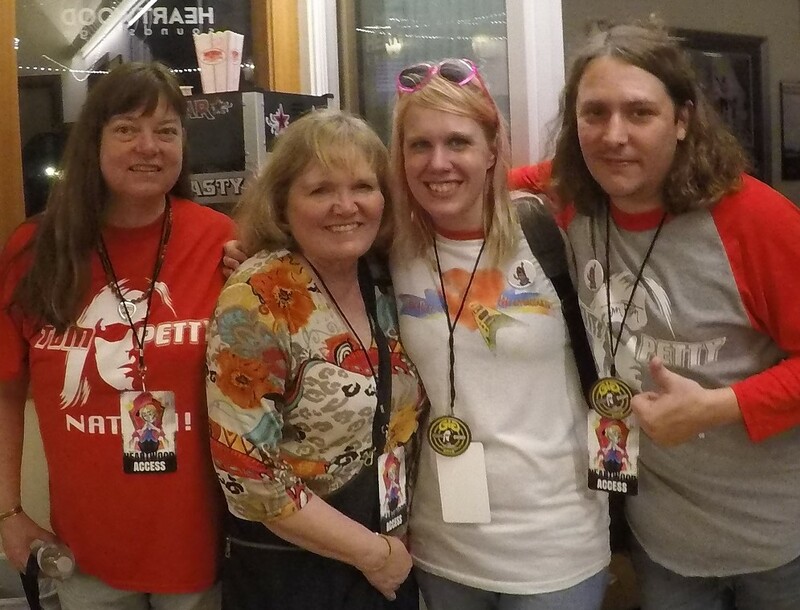 In that spirit, more than 200 Tom Petty fans — including dozens of members of the Tom Petty Nation fan club from across North America — attended a meet-and-greet event Thursday night at Heartwood Soundstage. “This is a healing weekend for many of us,” said Angel Miller, from Strathmore, Alberta. 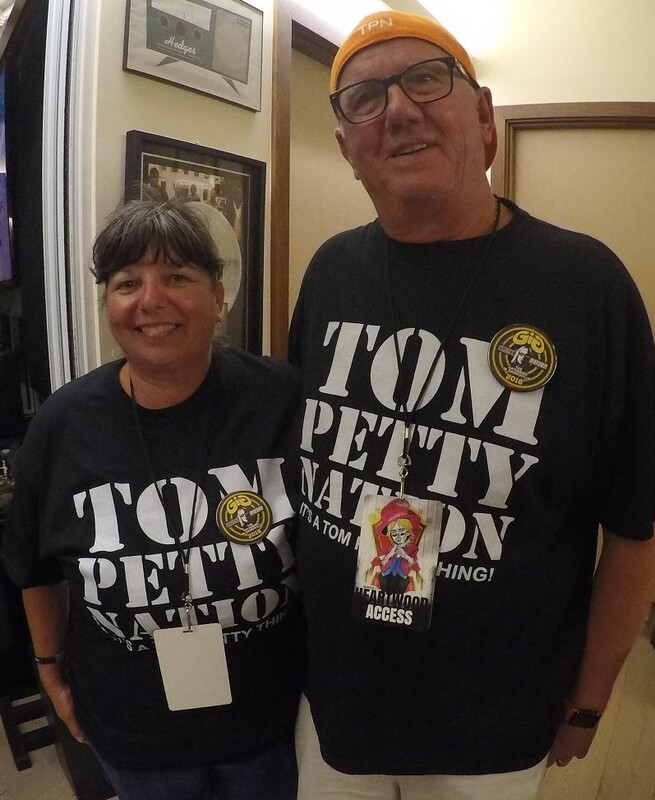 Miller and her husband, Wayne, were both wearing custom-made T-shirts listing each Tom Petty and the Heartbreakers concert they had attended, as far away as Isle of Wight in England in 2012. “We’ve seem him 14 times, including six times on his 40th-anniversary tour last year,” she said. Two of those shows were at the Hollywood Bowl, the final stop on the tour only a week or so before Petty’s death, which was attributed to an accidental drug overdose. Members of Tom Petty Nation — some 33,000 strong — were suddenly left with nowhere to go to enjoy his live music. “We used to meet at his concerts, but now there are no more,” Miller said. “This [Tom Petty Weekend] is a nice way to get together. Nearby were Tom Petty Nation fellow members Susan Shauff of Boise, Idaho; Debbie Homan of Fort Collins, Colorado; Rob Nechanicky of Fairbault, Minnesota; and his girlfriend, Katie Sunflower of Prior Lake, Minnesota. They all speak of Tom Petty with the highest praise. Shauff said she started listening to Tom Petty a decade ago when her mother was going through a serious illness. Nechanicky said it was important for him and his girlfriend to make the pilgrimage to Gainesville. “I just wanted to come back to his hometown and show him the love and respect and to say ‘This is how much your guy meant to us,'” he said. Perhaps the youngest fan of Tom Petty on Thursday night was one of the performers. Jake Thistle, 14, played a half-hour acoustic set of songs by Tom Petty and the Heartbreakers and Mudcrutch. 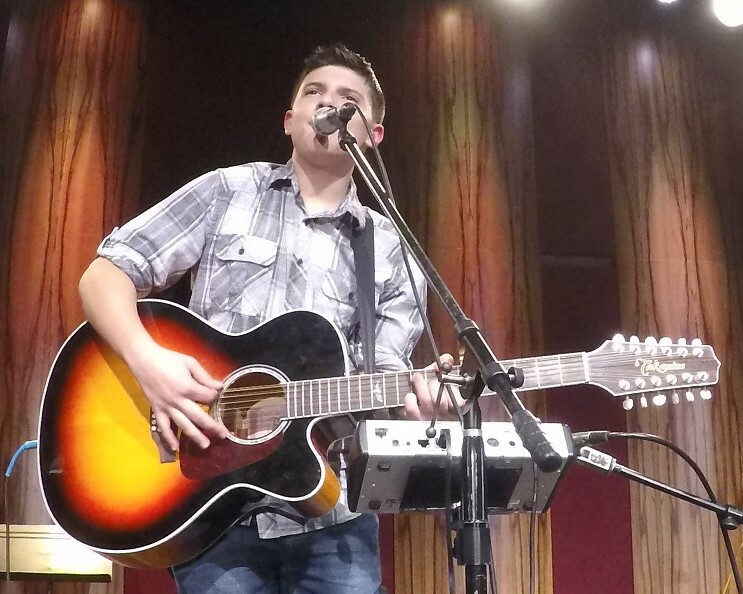 The ninth grader from Paramus, New Jersey, will also perform twice today at Heartwood and again Saturday at Depot Park and First Magnitude Brewing Co.
“To perform in Tom Petty’s hometown is a huge honor,” Thistle said. “I’m really excited to share an appreciation for Tom’s music. Thistle told the audience that he first heard Petty perform during the Super Bowl halftime show in 2008 — when he was just three years old. Thistle’s bedroom in New Jersey is a shrine to Tom Petty and his music. For further info, visit the Tom Petty Weekend at Heartwood and Tom Petty Birthday Bash websites.